Walk to Plaza & Canyon Rd, Sunny and Bright! Perfect for family and friends! This is our Opera House. It is the perfect house for you, family and friends to enjoy your Santa Fe vacation. 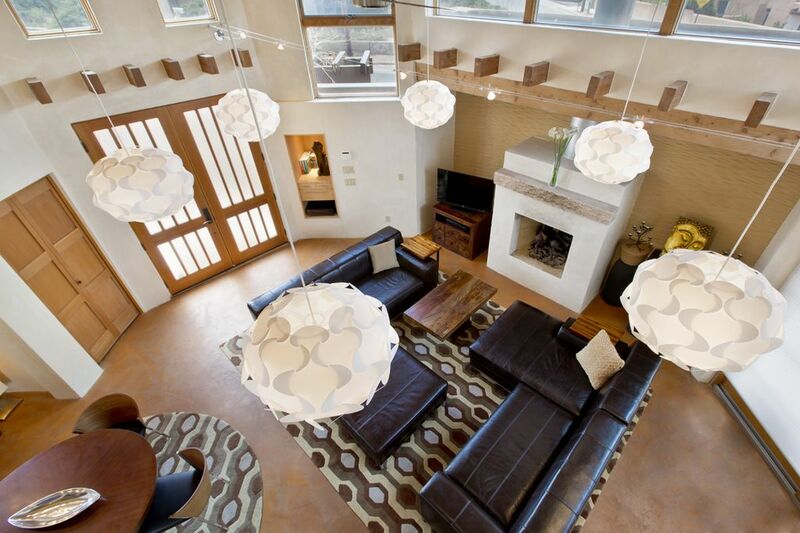 Contemporary Santa Fe style with hand plastered walls and charming vigas (ceiling beams) throughout. The center of the house is its large great room with lots of light and the Santa Fe sky, high ceilings, comfortable seating. This space will be the center of your Santa Fe experience. The gourmet kitchen is fully outfitted. While this open concept kitchen / living / dining room is perfect for entertaining, the three bedrooms offer the perfect amount of privacy. Each of the three bedroom suites has its own bathroom and TV. This house can accommodate 6-7 people very comfortably. and create new memories with family and friends with elegance and comfort!!! It is located just blocks from the Plaza - 5-6 blocks. A few blocks further and you are at Canyon Road or the Railyards. We live in the same neighborhood and really love it. * Three bedroom suites with own bath & TV. * Luxury bathrooms w/ travertine tile & towel warmers. In total you can have 12 bedrooms (sleep up to 28 people comfortably). All three houses are located on the same neighborhood. Please inquire. Looking forward to hearing from you! Thanks!!!! Justin is an architect and Sandra is a marketing and operations professional. We live in Santa Fe and travel the world finding unique details to make our houses more special. We live in the same neighborhood (over 20 years) and are looking forward to hosting your Santa Fe vacation! You will have a great time! We have designed, built and decorated our Opera House thinking on every detail to make your vacation and experience special. This house also is located in a safe neighborhood just blocks from the Plaza and Canyon Road. The Opera House is perfect for one person or for group of people looking to relax together in the great room. Each bedroom has its own bathroom. Close to downtown, easy walk. Travertine tile, towel warmers. Very stylish. Master suite, guest suite, living room, dining room and kitchen. The open concept kitchen - dining room - living room is perfect for relaxing or entertaining. It creates a wonderful place to hang out and create new memories with friends and family. The open concept kitchen - dining room - living room is perfect for relaxing or entertaining. It creates a wonderful place to hang out and create new memories with friends and family. The house is walking distance to the Plaza. Thank you for letting us stay in your wonderful home. We all slept well; the fireplace and great room were perfect for catching up, drinking wine and relaxing after a day of hiking and exploring. Two families had an awesome time. The place looks exactly like the pictures. It is a very convenient location (1/4 mile from plaza, super close to direct route to Ski Santa Fe). Convenient for day trips to Tent Rocks and Bandolier. Parking for 1 car provided but street parking right next to house no problem for second car. Hosts appear to have thought of everything including tide pods, dishwasher soap, shampoo, garbage bags, etc. Beds very comfy, sheets and towels smell great and there are towel warmers in the bathrooms!! Very attractive yet comfortable and welcoming home away from home. Would highly recommend. Our stay at the North Hills House was great. Sandra and Justin were perfect hosts and very helpful and accommodating—and delightful. The house is so comfortable, warm and inviting. Consistent temp whether warm and sunshine or heavy snowfall, of which we had both. Excellent location. Highly recommend. My family and I enjoyed staying in Santa Fe and your condo was perfect for us! The condo is modern, comfortable, and in a great location. There's a grocery store nearby for supplies and it's in walking distance to the square. A great sunset viewing spot is right up the street! Three bedrooms and each bedroom has their own bathroom - ideal! We had 3 couples that stayed for a long weekend and we were so happy with this home. It's spacious and we loved that each couple had their own room and their own bathroom. We also loved that it is just a short walk to the plaza. Highly recommend it! The Opera House was a convenient walk to Santa Fe, and an easy road trip to the sites beyond. Sandra and Justin were wonderful hosts, and the house is lovely and well appointed. I'll definitely be back. Located just north of the Plaza, near Ft Marcy. EASY walk to Plaza, Canyon Road and Railyard. Low season - $275/night / Mid season - $350/night / High Season - $395/night (Holidays - different rates may apply). Rates vary according to season and length of stay, but are very reasonable. Please contact us with exact dates so that we can provide you with details and available PROMOTIONS for 4+ nights stay. • Cleaning Fee: $150 (up to 4 people) Incredible last minute rates - please inquire.